Join the discussion on our forums! 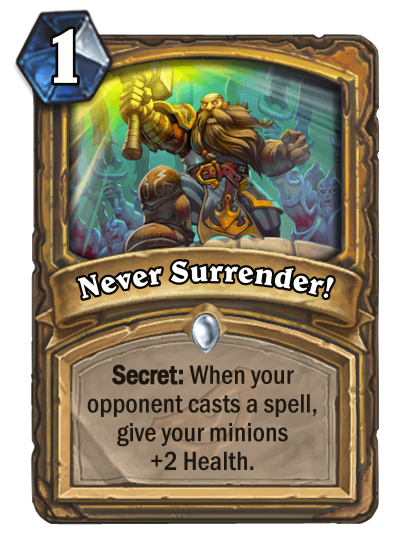 Come discuss Never Surrender! over in our dedicated Never Surrender! discussion topic. 1-mana AoE Counterspell for an aggro class. Tough to play around, especially if Commander Rhyssa is on the board. Particularly unfair for your opponent because it proccs on any spell, not just AoE or damage spells. A more fair version would limit it to damaging spells. If this wasn't a secret and just a spell with this cost and effect, would you play it? I wouldn't. Now make that spell even worse because now your opponent can play around it. However, it'll most likely be seen a lot because of Desperate Measures.